Egypt bomb blast at Ismailia killed at least one person. The incident took place on December 12, 2013., a photo by Pan-African News Wire File Photos on Flickr. Anyone who joins Muslim Brotherhood marches will receive a five-year prison sentence, the spokesman of Egypt's Ministry of Interior said Thursday following the government's declaration that the Brotherhood is a "terrorist" organisation, MENA reported. Those who are proved to be members in the Brotherhood, anyone who promotes the group verbally or in writing, as well as those caught carrying publications or recordings of the group, will also face the same sentence, ministry spokesman Hany Abd El-Fattah added. Meanwhile, anyone who takes up an administrative position in the group, finances it with money or provides information to the group, will face a hard labour sentence. In a press statement Wednesday, Deputy Prime Minister Hossam Eissa said the cabinet declared the Brotherhood a terrorist group, making it subject to Article 86 of the Egyptian penal code, which defines terrorism and the penalties for engaging in it. Eissa said the deadly bombing in the Delta city of Mansoura Tuesday, as well as recent attacks on churches and other violent incidents attributed to members of the group, led to the decision. 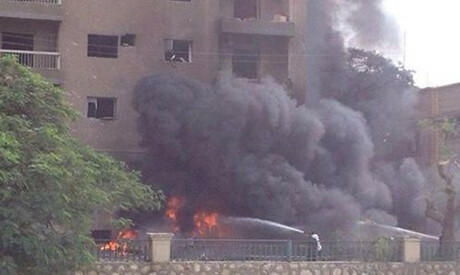 Sixteen individuals, mostly security personnel, died when a bomb exploded near Mansoura's Security Directorate. More than 135 were injured. The government blames the Brotherhood for orchestrating attacks on its buildings and security personnel since the ouster of Islamist president Mohamed Morsi on 3 July. The Brotherhood deniedTuesday involvement in attacks on government buildings and security personnel. Meanwhile, Ansar Beit Al-Maqdis, an Al-Qaeda-inspired Islamistmilitant group, claimed responsibility for theMansoura blast. A leader of the Muslim Brotherhood vowed that the movement would keep up protests after Egypt's government designated it a "terrorist" group Wednesday. "The protests will continue, certainly," Ibrahim Munir, a member of the group's Executive Council, who is in exile in London, told AFP, adding the government movewas "illegitimate." The Egyptian government has conducted a crackdown on the Muslim Brotherhood in the aftermath of the violent dispersal of two pro-Morsi sit-ins in mid-August. Several thousand members of the Brotherhood have been rounded up by the authorities and its top leaders face trial on charges of inciting murder and espionage among other crimes.